Madison Oval Estate Lawn One Line Plaque in Green and Gold. 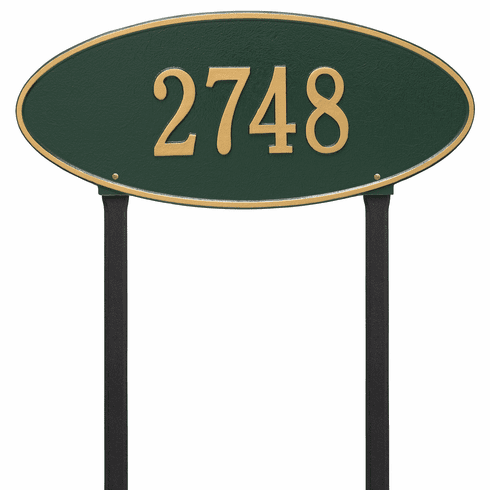 The classic oval design of our Madison Address Plaques makes it ideal for most any home's exterior. Available in a variety of finish colors to accommodate your outdoor color scheme. Cast from recycled aluminum - will not rust. Aluminum shield coating. All Weather Coatings. Enhances curb appeal while adding value to your home. Personalization is permanently cast into the sign. Please check for accuracy; personalized orders cannot be modified, cancelled, or returned after being placed. Made in USA. It can hold up to 5 numbers 4.5 inches in height or 17 characters of 2 inches in height.